I’m breaking my own rule about overreacting to anything I see in the preseason. But after two games, and heading into game three Sunday, I’m worried about the performance of the Bills offensive line. This position was a concern even before the preseason games began. 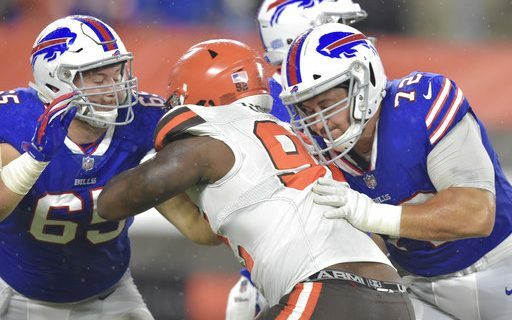 The departures of Eric Wood and Richie Incognito, the team’s two best O-line players, was sure to have an impact. You can’t take two Pro Bowl-level players out of the lineup and expect no impact. Especially, who’s unique athleticism and smarts kept that unit moving in the right direction. The lack of running room against the Browns, along with some serious protection breakdowns, is why I’m not sure the Bills have properly replaced those two players. You could argue that the new players in new spots like Vlad Ducasse, John Miller, Ryan Groy and Russell Bodine are really just backup-level players. All have been, except for Bodine. He started for four years in Cincinnati. As part of my presesaon practice to now overreact, I understand that the offensive lines never look very good in August. It seems like every year there’s complaining about the line. This is usually the time when those five men get used to playing with each other, thus the lack of success. But when you don’t really replace high level players, being concerned in the summer is legitimate. Bills assistant Juan Castillo is considered a top flight O-Line coach. So it’s clear the Bills are banking on his ability to get this unit to jell. He did do a good job last year, especially with Dion Dawkins and the move to left tackle during his rookie year. He was behind the signing of Ducasse, and his move into the starting lineup. The veteran wasn’t great, but adequate at left guard ahead of Miller. So it’s understandable that GM Brandon Beane took Castillo at his word and chose to bypass any notable free agent signings or draft picks other than Bodine. That’s fine. Good teams have to rely on good coaches. I don’t doubt Castillo will do that. But when? Can Miller be rescued from last year’s inactive list? Can Bodine, a player basically run out of Cincinnati, find a new life here? Can Groy, a career backup, be better than Bodine? Let’s not yet pencil in Dawkins as a blind side protector. I like his athleticism and length, but are we sure he is, without question, good enough to play left tackle? Not like the Bills have many options. So a lot of what this offensive line does in 2018 will depend on Castillo’s personnel usage decisions, and his coaching ability. Right now, it seems that Ducasse is set at left guard. Miller is the right guard. There has been every little competition for those spots. Ducasse started 12 games at right guard last year, the most season starts in his career. He was OK. I don’t know that anyone could say much more than that. He’s a eight year NFL veteran who knows his way around the trenches, and knows what Castillo expects. With most of his career as a backup, he’s used to moving from side to side. I assume that Ducasse’s ability to switch is why he moved and Miller stayed right guard. Miller started the first four games last year at right guard, after 28 starts there in 2015-16. It was odd to me that once the Bills moved Ducasse into that spot, Miller was a forgotten man. He was inactive the rest of the season. That likely had as much to do with game day roster management and Miller’s inability to play another position. But it was still odd, that a 32 game starter would disappear like that. There was something that Castillo didn’t like, or liked better from Ducasse. But heading into his last contract year, the Bills kept him around. Now, they need him to be the player he was as a rookie when he started 12 games on the NFL’s top rushing team. This competition has continued from the start of OTA’s up until now. Groy will make his second start against the Bengals. These are two very different players, and that may be part of the reason that no decision has been made. Groy is bigger and stronger, more of a mauler at the position. Bodine is more athletic, and the knock against him in Cincinnati was his lack of strength. He is mobile like Wood was, and the Bills used Wood last year to lead plays. So that plays to Bodine’s ability. But Groy should be better at handling big defensive tackles. With Geno Atkins lined up on the other side of the line, Groy’s start makes sense. At best, both guys seem like borderline starters/backups to me. But there are no other choices for the Bills. There’s hasn’t been much talk about Dawkins and Jordan Mills. Probably because of the focus on replacing Wood & Incognito. As I pointed out, Dawkins impressed last year at both right and left tackle. He is a legit NFL starter, and a good draft pick. But is he a left tackle? Mills is a favorite whipping boy of Bills fans, but he’s a savy veteran with 66 career starts. You can’t have first round picks at every O-Line positions. You need some steady, solid vets. That’s Mills. He’ll get beat at times by the league’s best. But he usually gets the job done. Both will get tested Sunday by Bengals defensive ends Carlos Dunlap and Michael Johnson. My concerns will be eased if the offensive line can do a good job on Sunday. Open some holes for the backs, but more importantly, give Josh Allen time to throw. Part of the evaluation of Allen’s first start will be how much time he has to throw and how much he has a clean pocket. Just like the line let down A.J. McCarron in his start against the Brown, the line can’t do that to Allen. His performance, and how it will impact the decision on an opening day starter, will have a lot to do with how the line blocks for him. That extends into the season. If this is to be a year that Allen learns how to play the position in the NFL, he’ll need the line to block well and give him that chance. I won’t jump to any conclusions either way, but I’ll feel a lot better if we’re not talking about the offensive line on Monday.